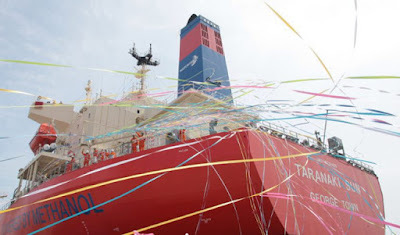 In preparation for the International Maritime Organization’s upcoming 2020 sulphur limit, the shipping industry started considering a number of solutions, including low sulphur fuel oil (LSFO), marine gas oil (MGO) and Exhaust Gas Treatment (scrubbers). While some experts believe that the answer lies in a replacement for dirty fuels, others believe that scrubbers are the way to go, however, the industry expressed its concerns over the costs of these solutions in more than one occasion. Methanol is the option that has probably received the least coverage despite offering a pathway to a sustainable, 2020-compliant, low carbon future for the industry, achievable at manageable cost and with minimal changes to the operational profile of the majority of affected vessels. This also makes it simple to perform engine work or repairs to fuel delivery systems as methanol can be easily purged from fuel lines for completely ‘dry’ work with little ‘clean up’ as with a traditional fuel, he added. Methanol dual-fuel engines also feature sealing oil for the injection ports, which trap any potential leaks. The availability of methanol is one of its strong points as a marine fuel. As a widely used petrochemical feedstock, it is present at hundreds of ports worldwide – and at nearly all the current centres for conventional marine bunkering. Methanol is the world’s most widely shipped chemical commodity, with an estimated 26.7 million tonnes shipped in 2017, according to Clarksons Platou. What needs to be developed is the bunkering infrastructure to support widespread distribution – though this is also true of LNG as fuel. Options include bunkering from trucks (as with early LNG as marine fuel projects), or via dedicated vessels and it is perfectly feasible for existing bunker barges to be converted to handle methanol. Onshore storage of methanol is simpler than LNG because no cryogenic facilities are required as methanol is a liquid at ambient temperature and there are some well understood and readily available methods of safely storing and handling methanol that present no exceptional safety risks. The shipping industry has certainly flirted with LNG as fuel and it has found it to be a viable solution for non-gas carriers. However, conversions and newbuildings are expensive, technically complex and operations are challenged in terms of supply infrastructure. Critically, while LNG solves the SOx/NOx emissions slate, its CO2 and methane emissions profile means it cannot be a long term solution for the decarbonization of shipping. Further, LNG requires dedicated bunker supply chains that require enormous sums of public/private funding. Methanol as marine fuel has few of these disadvantages. As a liquid fuel it is easy to store and handle despite having a lower flashpoint than conventional fuels and it is less harmful to the environment or marine life in the event of a spill.